If you aren't a morning person, you can definitely relate to this gloomy donkey! His floppy ears and frank expression are accurately illustrated in Romero Britto's colorful, optimistic art style. Shake off the morning blues with this sculpted Eeyore mug. 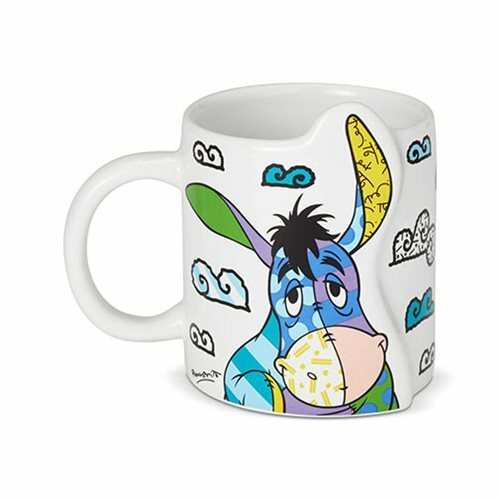 The Disney Winnie the Pooh Eeyore Mug by Romero Britto measures about 4 1/2-inches long x 3 3/4-inches tall x 3 1/8-inches wide. Brazilian-born and Miami-made, Romero Britto is an international artist that uses vibrant, bold, and colorful patterns to reflect his optimistic view of the world around him. Britto has created a visual language of hope and happiness all its own that's relatable to all, inspiring millions. As an artist, painter, serigrapher, and sculptor, he combines elements of cubism, pop art, and graffiti painting in his work. The Disney by Britto collection captures the fun and whimsy of Disney in the vibrant hues and bold patterns of this pop culture phenomenon. Romero Britto's creations are truly a delight to behold!